4.2 out of 5 based on 147 bloggers and 29 commenters. 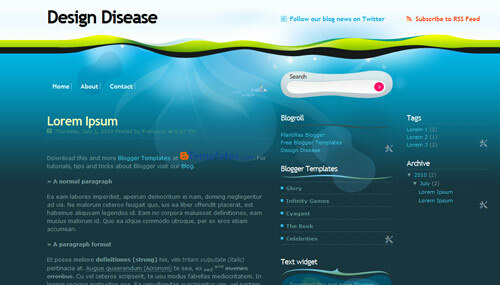 Design Disease is a free premium blogger template adapted from WordPress with 3 columns, right sidebar, web 2.0 design, fresh look, rounded corners and vectorial elements. Excellent template for blogs about animals, art, fantasy, food, nature or travel. I want to know how I would be able to have these desings in my blog??? @Myri You can find the answer to your questions and more in our FAQ section :). @Volverene Evo Thanks! :) Is a great work of Elena. Could you please tell me how I might create a blogroll as seen in the preview and how to edit the text widget? @Coty: There are two gadgets that yoy may use to create a Blogroll. Just go to Design/Page Elements and add a “Link List” or a “Blog List” gadget and put your links there. excellent template !!! good job!! güzel tasarım ama reklam filan koymak istenildiğinde aşırı sırıtır.. I used this template,this is really awesome. I use blogger,in layout it displays only one column how can i add gadgets to the next column??? there is a single side bar but in preview there are 2 sidebar plz help how to add third column?? @pepoin: Go to Design/Page elements and add gadgets in both columns. Both Raja and Pepoin are talking about the same error : in preview mode it look like there are 2 columns but in design mode there are only 2 columns. therefore, the 3rd column is not available to add mode widgets. How can we add widgets on the 3rd collumn if it doesnt appear? How to change the link of the follow us on twitter and subscribe to rss feed????? how to enable the 3rd column? A 3rd column isn’t available in layout? The design don’t work! Worldpress say me: The package could not be installed. The theme is missing the style.css stylesheet. Please help! Do you have a link to the post-body-li.png file? Becuase the un-ordered lists appear without the bullet.